It’s early in the morning, I’m starting my day and I do what every other vendor does in the wedding industry, check their social media accounts. Post after post of congratulations on my Facebook Feed. 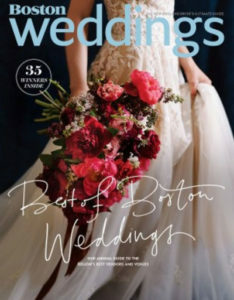 I’m so confused, I literally have no clue what is going on so I click on my notifications to see Boston Magazine – Weddings has tagged me to an article. I read through, thinking aww good for her, ohh I lover her, so happy for them and then BAM there it is, Planned Perfectly Wedding and Events listed as the Top Five Amazing Local Day-Of Coordinators. YES I screamed and there may have been a few fist pumps in the air too! I am so proud of this acknowledgement and more proud of our team, Chelsey Ellis, Brittany Mullen and Alexa Mikula. These ladies give it their all for our clients. Long hours, sore feet and achy backs are all worth it at the end of the day when a couple hugs you with all their love to say “it was everything we wanted”!